Join the owner of Sinopia, Alex Warren, at the Sinopia warehouse in San Francisco, for an in depth seminar covering pigments, binders and making chalk grounds/gesso. This seminar will give you an extensive overview of all pigment types, how to classify the pigments and how to select suitable pigments for different applications. The class will also cover all the binders for such media as oil paint, acrylic, watercolor, egg-tempera, casein/milk paint, etc. Not only will all the binders be explained and demonstrated, participants will learn how to select the optimum binder for different applications and you will be able to try all of binders yourself on a panel prepared with a traditional chalk ground. In tandem with this seminar, students will learn how prepare their own gesso ground made with rabbit skin glue and chalk. You will gesso your own panel, which you can take home at the end of the day. The full class fee for this seminar is $275.00 and covers all of the materials used in the class. The deposit holds your spot in the class and is fully refundable until August 31st, 2019. The balance of the class fee is due on the day of the seminar, payable with a check or in cash. This is a class that will give you some important fundamental information about paints and material practices. We always like to say that: an artist who doesn't understand what is in their paint, is like a chef who can't chop an onion. We feel that using cooking analogies, makes the idea of pigments and binders a more organic experience, rather than sitting through a chemistry class. No boring lectures here! Additionally, this is not a class that will give you a hands on experience in creating one type of painting technique and you will not be sent home with a piece of work that looks like all of the other students' creations. Instead, you will be able to experience all types of paints on your own gessoed panel! 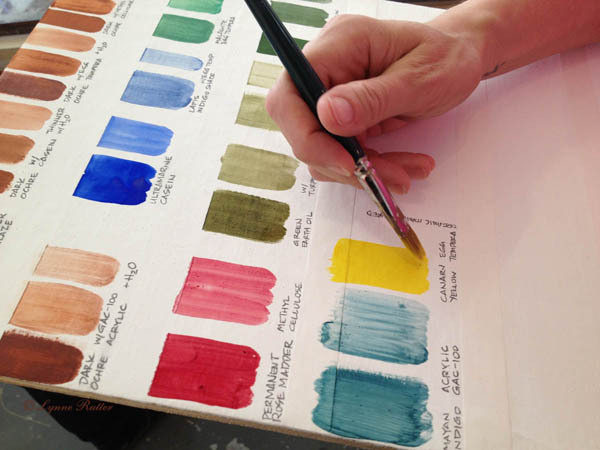 Introduction to Pigments and an Overview of the Class. Answering general questions and allowing participants to have an input on the direction of the class. In depth discussion of all binders, such as oil, casein, acrylic, gum arabic (watercolor/gouache), egg tempera, etc. Students will experience first hand how the different binders affect pigments. Gaining a strong sense of how binders can be used in their most effective ways. Concurrent with all parts of the class, each student will learn how to gesso their own panel with a traditional chalk ground. This is also a hands on part of the class. I will have some gessoed panels for you at the beginning of the class, so you can start painting right away! An in-depth discussion of all types of pigments. I will take you through the dizzying array presented by the pigment world and help you find a way to classify pigments and create a system to effectively categorize all pigment types. More hands on painting with the paint that is being demonstrated. In the afternoon session I'll pull out all of the exotics, such as lapis lazuli, genuine indigo, azurite and many other gems from the Sinopia Pigment selection. In-depth Q&A session to cover topics and issues that were not covered in the class. Each student will have a chance to gesso their own panel with a traditional chalk ground made from chalk and rabbit skin glue. Each participant will be provided a minimum of one panel that has been prepared for the gessoing process. Additionally, more panels will be available at no extra cost, to any student who wants to make more panels. Q: What is the class start/end time? I’ve been looking for a seminar like this for a while, but I would need to fly in because I’m in Las Vegas. A: Class will start at 10am and usually ends between 4-5pm.